1.To ensure that measured object larger than an infrared instrument circular spot diameter. 2.The small the target,the thermometer should be closer to the target. 3.Make sure that the object is not less than twice the area of the measuring point. 4.Hot Location: To find a hot spot ,the first unit at the outside of the measured area and then slowly moved up and down the thermometer to scan the entire area until hot determine test points. 5.Thermal shock caused by environmental temperature changes: If so, it will take 30 minutes before it can be used. 6.ENSURE there is not other hotter body near the target which makes measurement less accurate. 7.ONLY SURFACE temperatures can be measured. 8.DO NOT point the laser at human's eyes (eye damage may result from direct exposure to laser light). 9.DO NOT put this unit in water. 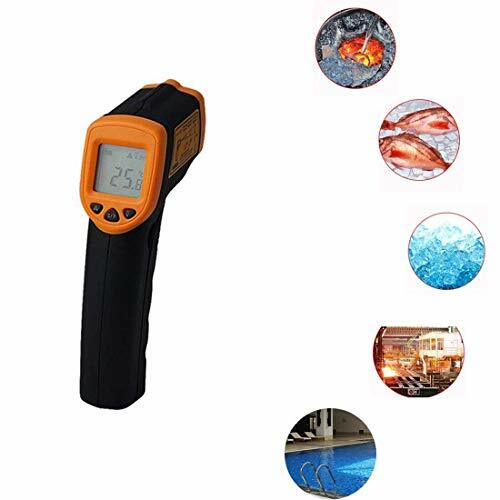 ★ WIDE TEMPERATURE RANGE - Thermometer safely measures temperatures from -26°F to 608°F (-50°C to 380°C) without having to get in contact with the surface and has a response time 500ms. ★ PRECISE MEASURING - Built in laser technology helps ensure the most accurate readings possible. Aim digital thermometer at target surface and press trigger, laser will show exactly where temperature is being measured. Infrared thermometer has a distance to spot size of 12:1. ★ MULTIFUNCTION - Auto shut off after 20 seconds without any operation to save energy. Low battery indication reminds you to monitor battery power especially for outdoor activities. Backlight LCD selection allows you to work in the dimly lit areas. ★ SPECIFICATIONS AND NOTE - Accuracy: ±2°C/±2%; Emissivity: 0.95pre-set; Power: 2 x 1.5 AAA Battery (Battery Included); Size:14.6 x 9.3 x 8.8 cm; Resolution: 0.1°C or 0.1°F; Repeatability: ±1% or 0.1°C; Response time: 500ms; Weight:130g; Shape: Gun-shaped; Auto power off Data hold; Laser ON/OFF selectable; Backlight ON/OFF selectable. This infrared thermometer is not suitable for human temperature measurement. If you have any questions about this product by Junboys, contact us by completing and submitting the form below. If you are looking for a specif part number, please include it with your message.